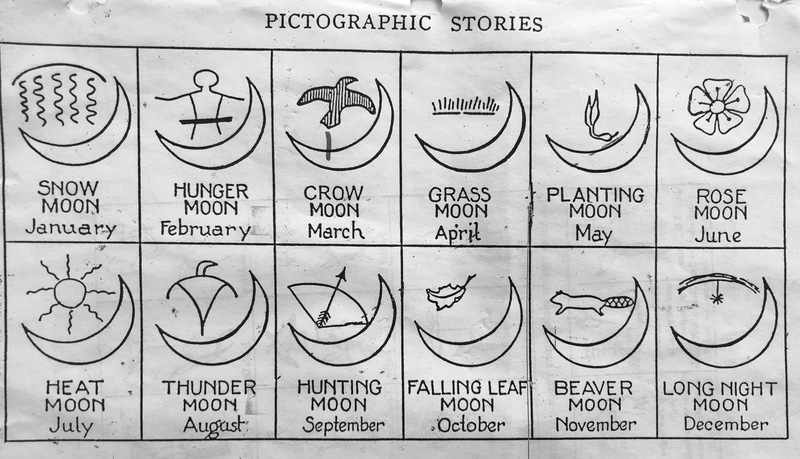 Called the “Stone House” by the Blackfeet, this storytelling game helps youth learn to construct a narrative and recall it later, re-telling it as closely as possible to the original. It involves serious memory work. The game also helps introduce the ancient rock art practice of pictographs and petroglyphs. Finally, it injects a level of assessment by including a player who will judge how well the story is told the second time. 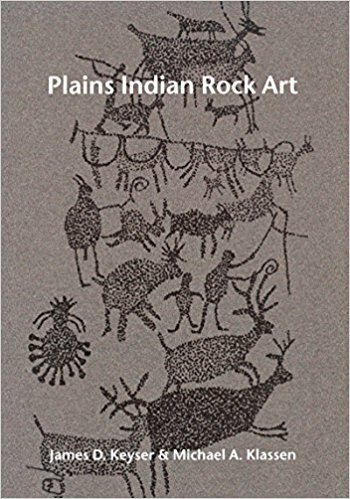 It is important to tell students that interpretations of the meaning of rock art may be tribal specific or universal. 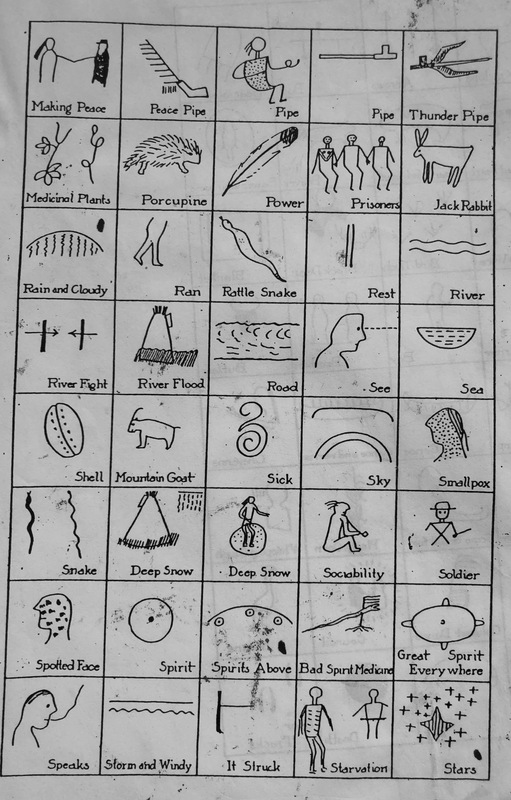 Sometimes interpretations involve guesswork, and sometimes tribal storytellers have preserved an understanding of the meaning of some of the symbols. Scholars have made careers out of cataloging thousands of examples from around the world, as this was a widespread practice in ancient times. They have studied the cultural context and interviewed culture bearers in order to get as close to the original meaning as possible. 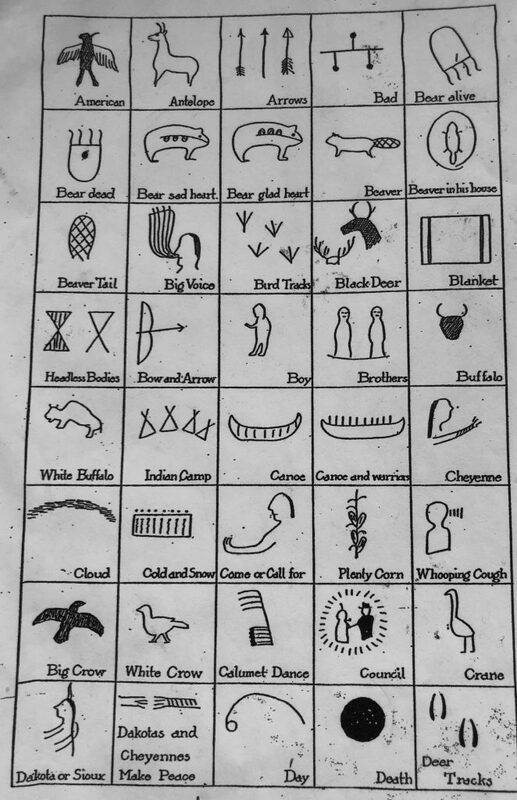 One version involves three people, two round pieces of felt (symbolizing tipi bases), and a number of stones that re-create pictographs on one side and provide an English translation on the back. 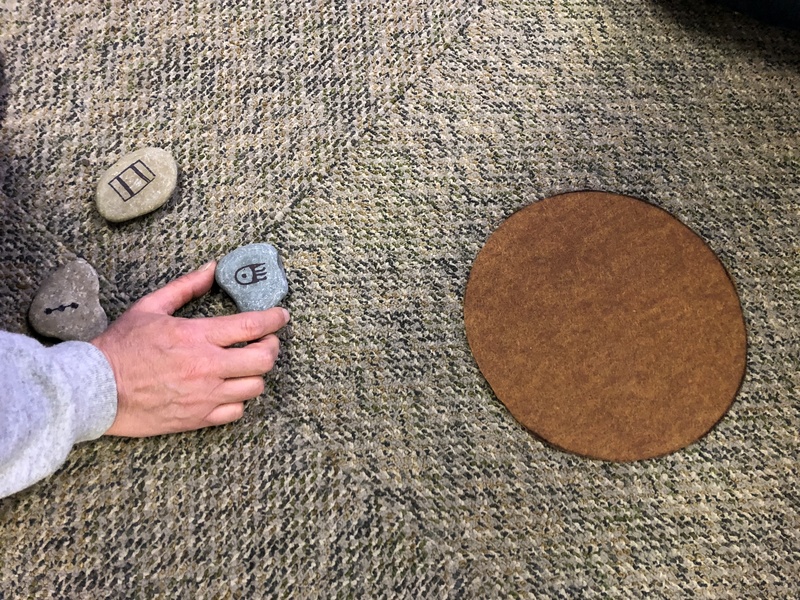 For a large group, the teacher could have the students break into groups of three, each group taking two of a larger number of felt circles, and perhaps four stones. The teacher may choose the stones the first time, and then in subsequent founds, students could trade stones among the groups. Playing the game multiple times will allow each player in the group of three to practice storytelling. When ready to begin, one person will look over the stones carefully, using them as the basis for a story. That person, while telling the story, will place the stones very purposefully on the tipi circle, conscious of their physical and metaphorical placement. The other two people will listen very carefully to this first telling of the story. One of these players will then volunteer to move the stones from that one tipi circle to the other one, placed at some distance away, while retelling the same story as accurately as possible and recreating the location and positioning of the stones as close as possible. The third person watches the entire process and judges the degree of accuracy of recall by the second person. The game may be repeated two more times in this group of three, so that all will have a chance at playing the different roles. The image above shows an example of a group of three stones about to be placed on one of the tipi circles. 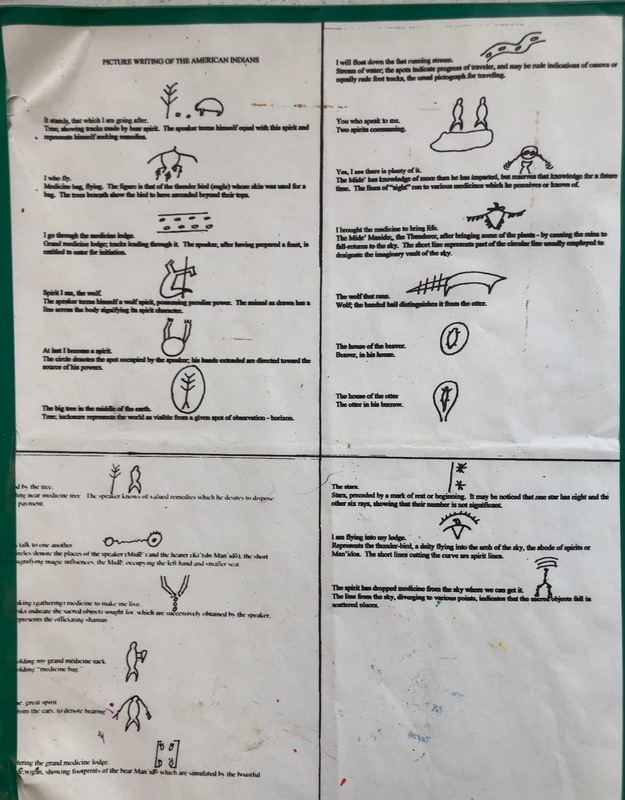 We are only seeing the pictograph side of thee stones here, but players are allowed to read the backs prior to constructing an appropriate story. The circles can vary in side, but this one is about 6″ in diameter. The images below show examples of pictographic stories gathered from many different tribes. 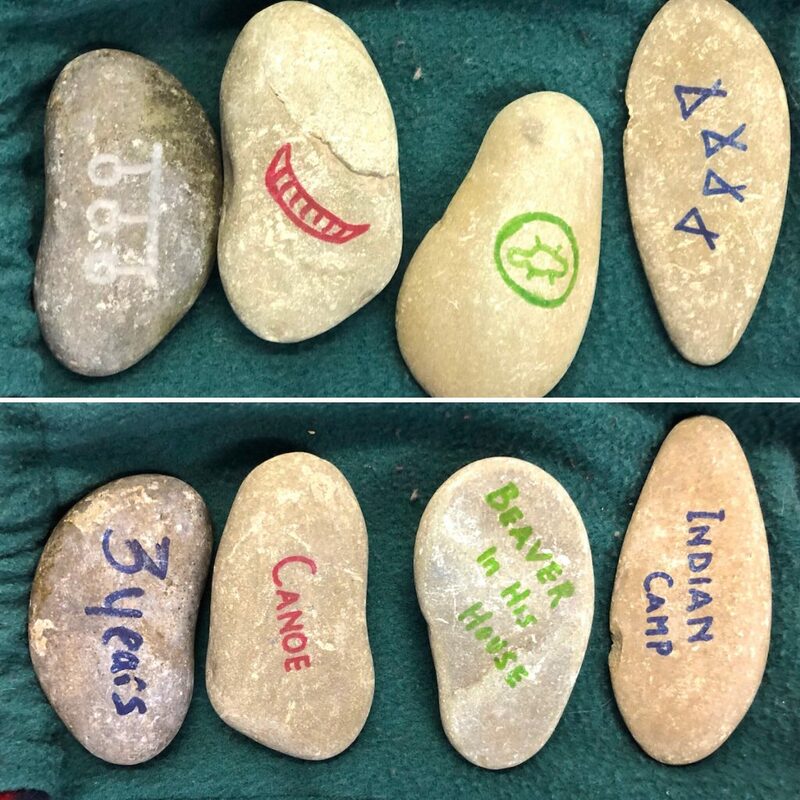 Teachers and students might go to a river shore to choose flat round stones, scrub them, dry them, and then paint them with the symbols of their choice. 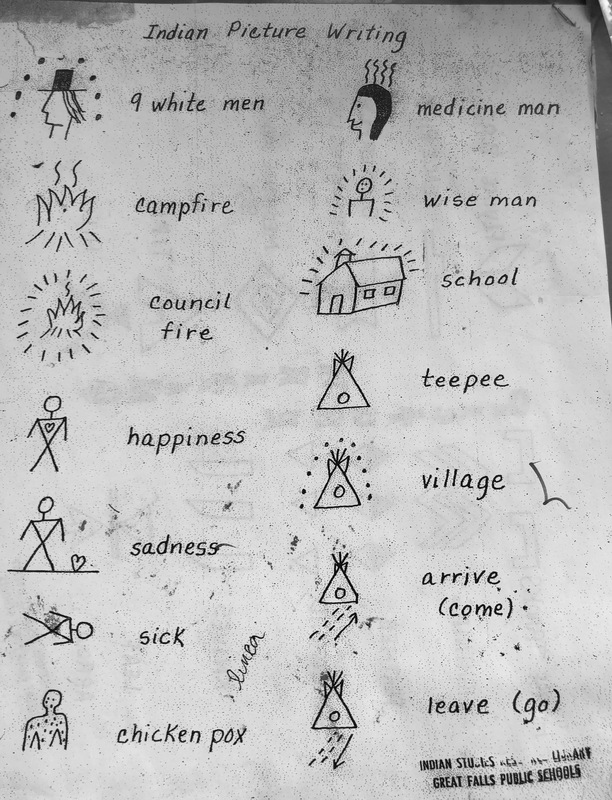 They will write the interpretation of these symbols on the back of their stones.